✔ Sealed Apple Thunderbolt 3 (Usb-C) To 2 Adapter MMEL2AM/A Model A1790 NO TAX! Hello. this is a 100% GENUINEGenuine Apple USB-C to USB Adapter MJ1M2AM/A Model # A1632. WHAT YOU SEE IS WHAT YOU GET. The Apple USB-C-to-USB Adapter lets you connect iOS devices and many of your USB accessories to a MacBook with a USB-C port. These are Amazon basics. You will receive two MFi Certified Lightning to USB 6 foot cables. Genuine Apple 3ft USB Extension Mouse Keyboard Cable . Condition is New. Shipped with USPS First Class Package. 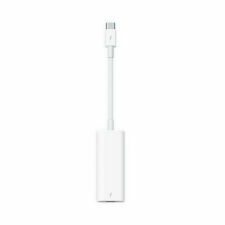 Apple USB to Ethernet Adapter A1277. 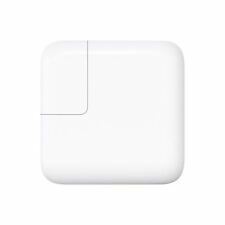 Connects to the Apple USB Power Adapter for Convenient Charging from a Wall Outlet. Connects Your iPhone to Your Computer's USB Port for Efficient Syncing and Charging. It is a high-quality adapter generally used for lengthening the reach of keyboards and other USB devices. Charge your phone un minutes! 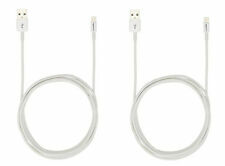 Open Box Lightning to USB Cable (2m) Color white. Product Features The Apple USB-C-to-USB Adapter lets you connect iOS devices and many of your USB accessories to a MacBook with a USB-C port. Item Condition Plugs your iOS devices and USB accessories into your MacBook. Use this cable to connect a Mac with Thunderbolt 3 (USB-C) to Thunderbolt 3 devices such as docks, hard drives, and displays. You can daisy-chain up to six Thunderbolt 3 devices. It's about a year old and still in good condition and works well. OEM Original Apple USB-C VGA Multiport Adapter for iPad iPhone. Mirror your MacBook display to your VGA-enabled TV or other display in up to 1080p. You can typically expect a response within 24 hours. 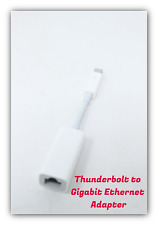 Thunderbolt to Gigabit Ethernet Adapter A1433 100% goes to Oregon Humane Society. Condition is Used. Shipped with USPS Priority Mail Small Flat Rate Box. Color-coordinated cables connect you to your smartphone and other mobile devices. Manufacturer: VOXX International Manufacturer Part Number: ARH750BG Brand Name: Acoustic Research Product Name: ARH750BG Apple Lightning 3 ft Power and Sync Cable - Black & Gray Product Type: Data Transfer CableCable Type: Lightning/USB Cable Length: 3 ft Connector on First End: 1 x Lightning Male Proprietary Connector Connector on Second End: 1 x Type A Male USB Features: Tangle-free Conductor: Copper Device Supported: Smartphone Color: Black/Gray. NEW Original Apple USB Keyboard Extension Cable 36"
Original Apple USB Keyboard Extension Cable 36" (591-0181). Condition is New. Shipped with USPS First Class Package. 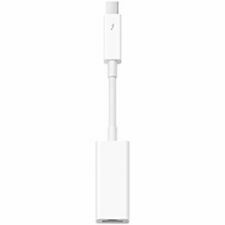 Genuine Apple USB-C to USB Adapter for MacBook MJ1M2AM/A (A1632). Condition is Used. Shipped with USPS First Class Package. Model # 13235. Monoprice USB Type-C (DP) to HDMI Adapter. ---Connect your iPhone, iPad, or iPod with Lightning connector to your USB-C or Thunderbolt 3 (USB-C) enabled Mac for syncing and charging. ---You can also use this cable with your Apple 29W, 61W, or 87W USB-C Power Adapter to charge your iOS device, and even take advantage of the fast-charging feature on iPad Pro, iPhone 8, iPhone 8 Plus, and iPhone X. ---Compatible with the following computers: 12-inch MacBook, 13-inch MacBook Pro - Thunderbolt 3 (USB-C), 15-inch MacBook Pro - Thunderbolt 3 (USB-C), 21. OEM Macbook. USB Ethernet. Adapter Apple. 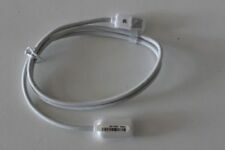 New Authentic Apple USB Type A to Ethernet Adapter A1277 $30+ new. Brand New Genuine in package Apple USB to Ethernet Adapter Easily connect your Mac computer to an Ethernet network with the Apple USB Ethernet Adapter. Small and light, it connects to the USB 2.0 port of your Mac and provides an RJ-45 connector that supports 10/100BASE-T performance. Apple USB cables, hubs and adapters are all accessories for your Apple computer, phone, iPad and more. They allow your main Apple to connect to various peripheral devices and thus sync and transfer data. Furthermore, the peripherals need come from Apple. As long as the connection system is available and compatible, you can connect and run non Apple peripherals too. This also supports people on Windows who install Apple operating systems on Windows computers via platforms like Boot Camp. You can then run Apple devices from it that only use only Thunderbolt or Lightning cables. What are Apple Connection Systems? A connection system includes the hole, known as a port (female), the plug (male) that goes into it, and the software that reads that type of data input. The USB connection system is cross-platform and has been around for a long time, undergoing new versions such as USB-A, B and C. Each version is faster than the previous one. However, Apple made various kinds of connection systems for only Apple computing devices. Some of the later ones are compatible with the ones that came before. 30-Pins. These are the oldest option, and people used these in chargers for iOS like Apple iPhones, iPads, iPods, and also cameras, etc. Lightning Connectors. These replaced 30-pin docks to suit the much thinner, faster models of iOS equipment. Thunderbolt Connectors. These followed Lightning and carries video, data and charging all in one. It runs at a speed up to 40 GB per second. Conveniently, Thunderbolt ports and plugs fit USB-C and vice versa. You can also daisy chain Thunderbolt peripherals off each other. What are the Types of Connectors? The types include cables for extension or chargers, sync cables, single adapters (converters), and hubs. Extension cords allow you to have your mouse, keyboard, etc, further away than the standard cables allow. They are especially handy if your space is too tight to plug a converter straight in or you need room around your keyboard. Charging cables allow you to recharge your Apple devices such as iPhones, mouse and keyboard with power adapters from the mains electricity or indirectly via the computer. In later models, the charging and connection functions often come in one cable. Converters can be single or come in the form ofmulti-port hubs . They allow devices with different connection systems (as above) to connect by converting one kind of connection system to another, eg: Thunderbolt or Lightning to USB. However, they also convert between versions within the same system, eg Thunderbolt 2 to Thunderbolt 3 or USB. If you have too many peripherals for the number of USB ports on your computer, or a mix of differently connected peripherals, a hub might be your answer. What Forms Do Adapters Come In? The number and type of components in your computer system and the shape of your work space govern your choices for mixed connections. For this reason, several forms are available. Most connectors are a length of cable with a female connector of one type at one end and a male connector of another type at the other end. A standalone converter is a small block with a connector port on one side and a plug on the other. It goes directly into the port on the computer, without a cable. A hub has multiple ports that may be all USB (the same or different versions) or have several ports for different types of connection. It outputs to one USB cable. A very important check to do is find out what model of cable, converter or hub will work with your Apple computer or device. They are not universally compatible. An example is that the models of Apple computer that have Thunderbolt 3 (USB-C) ports on them are the MacBook Pro from 2016 onwards, and the 2017 iMac and iMac Pro.